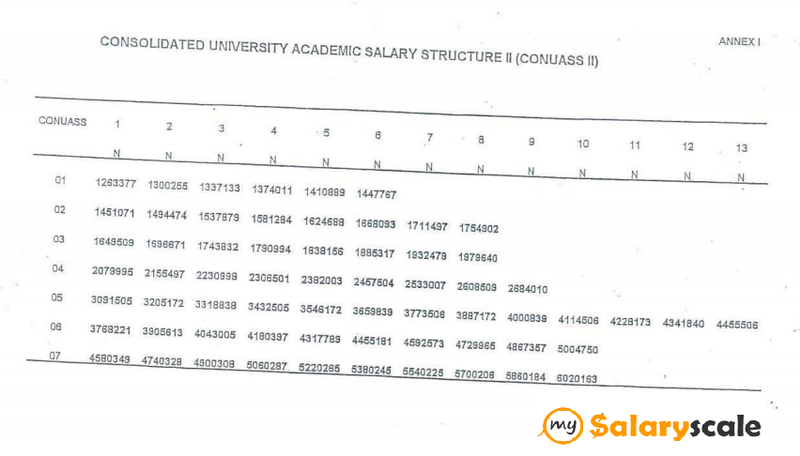 CONTISS is a salary structure that originated from the University Salary Structure (USS), which was introduced in the early 1980s, following the Cookey Report on the study of the problem of remuneration in the university system. This salary structure applies to the non-academic staff of universities; all academic and non-academic staff of Polytechnics, Colleges of Education, Research and Allied Institutes; and medical/dental/veterinary doctors/optometrists with OD Degrees in Federal Health Institutions such as Teaching Hospitals, Medical Centers, Specialist Hospitals etc. It also applies to all Federal Agencies formerly running the Harmonized Tertiary Institutions Salary Structure (HATISS). 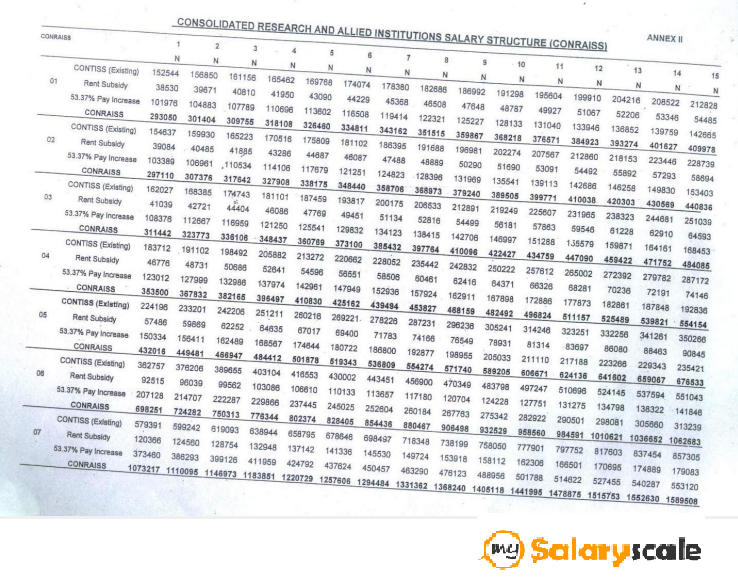 It is a 15-grade salary structure with each scale consisting of a number of steps ranging from 15 for the lower grades to 9 for the highest grades. The new structure known as the Consolidated Tertiary Institutions Salary Structure (CONTISS) is attached as Info-graph 1. The items consolidated with the basic salary are transport allowance, meal subsidy, utility allowance, leave grant, journal allowance, research allowance, learned society allowance, furniture allowance, examination administration allowance, field trip allowance, industrial supervision allowance, responsibility allowance, inducement allowance, administrative officer allowance, rural posting allowance, clinical duty allowance, teaching allowance, domestic servant allowance and driver’s allowance (for entitled officers). Following the separate collective agreements between the Federal Government of Nigeria (FGN) on the one hand and the Senior Staff Association of Nigerian Universities (SSANU), the Non-Academic Staff Union of Educational and Associated Institutions (NASU) and the National Association of Academic Technologists (NAAT) on the other, on 5th November 2009, the new salary structure for Non-Academic Staff of Federal Universities is thus known as the Consolidated Tertiary Institutions Salary Structure II (CONTISS II). 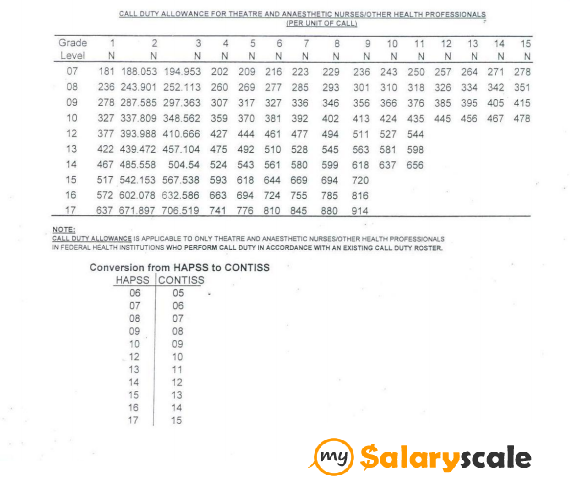 The new salary structure is attached as Info-graphs 3 and 4. This is applicable to all Non-Academic Staff in Nigerian Federal Universities. 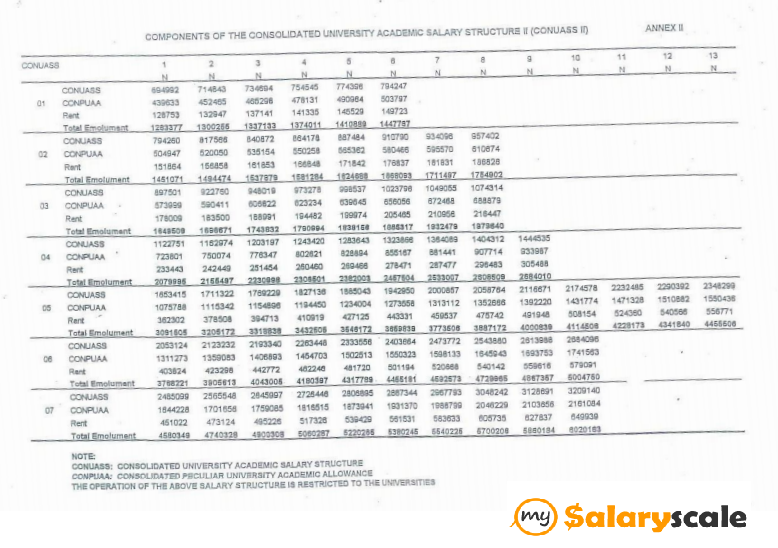 This is the salary structure for the academic staff of federal universities. The new structure known as Consolidated University Academic Salary Structure (CONUASS) is attached as Info-graph 5. 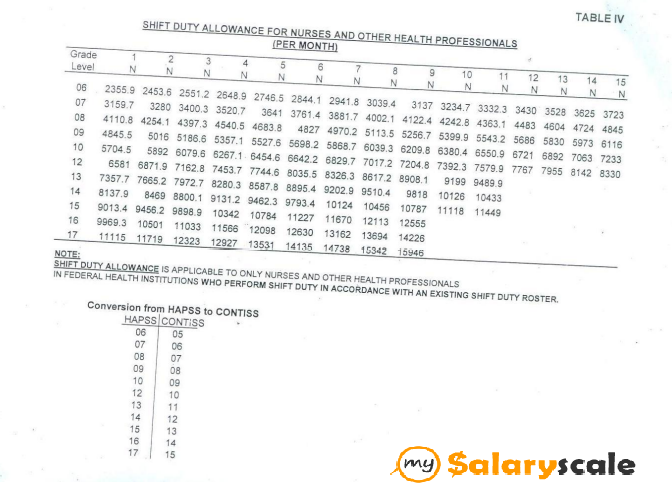 The items consolidated with the basic salary are transport allowance, meal subsidy, utility allowance, leave grant, journal allowance, research allowance, learned society allowance, examination supervision allowance, excess workload allowance, furniture allowance, industrial supervision allowance, field trip allowance, postgraduate supervision allowance, postgraduate studies allowance, responsibility allowances as well as domestic servant allowance and driver’s allowance (for entitled officers). However, Rent Allowance has not been consolidated with the rest of the allowances in the emolument package. It is, therefore, payable as contained in Info-graph 6, where a staff is not provided accommodation at Government expense. The Consolidated Peculiar University Academic Allowances (CONPUAA), exclusively for university teaching staff and derived from allowances not adequately reflected or not consolidated in CONUASS. 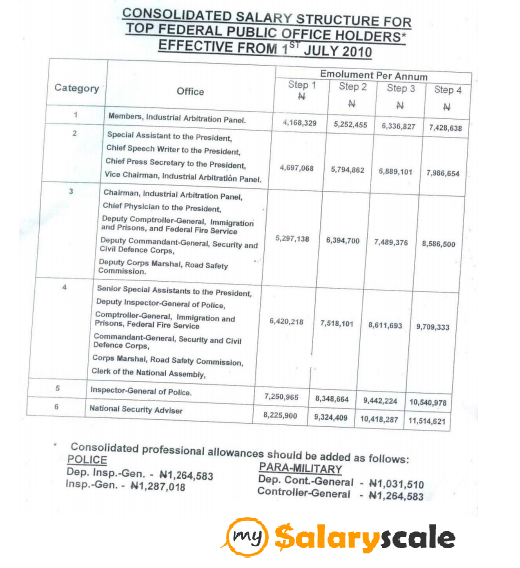 This is the new salary structure for Research, Training and Allied Institutions in the Federal Public Service. 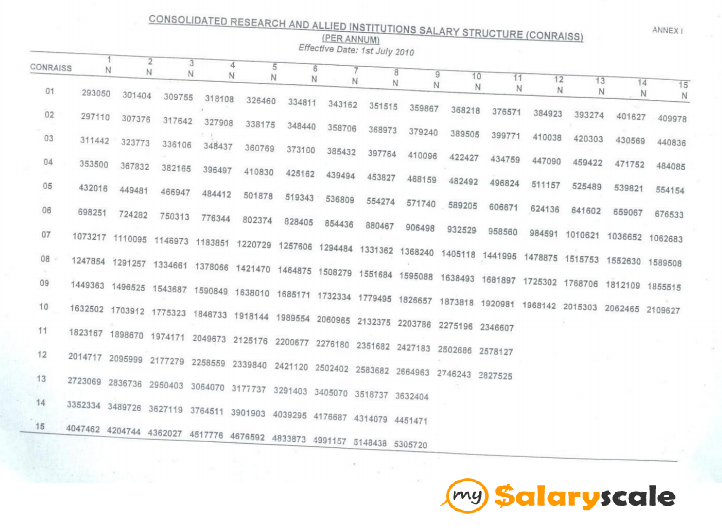 The new salary structure, known as the Consolidated Research and Allied Institutions Salary Structure (CONRAISS) is attached as Info-graph 7. This is applicable to various research and allied institutions in Nigeria such as Agricultural Research Council of Nigeria, National Agricultural Extension Research and Liaison Services, Center for Energy Research and Development, and etc. 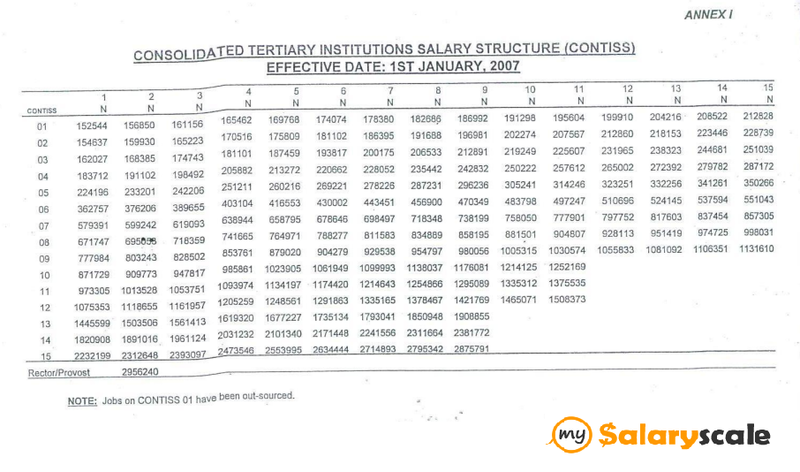 The Consolidated Tertiary Institutions Salary Structure (CONTISS) approved by the Federal Government of Nigeria (FGN) with effect from 1st January 2007 (FGN Circular SWC/S/04/S.301/1 dated 18th January 2007). Rent Subsidy as approved by the Federal Government with effect from 1st January 2007 (FGN Circular No. SWC/S/04/S.301/1 dated 18th January 2007). They are shown in Info-graph 8. The new structure known as the Consolidated Top Federal Public Office Holders’ Salary Structure (CONTOPSAL) is attached as Info-graph 9. The items consolidated with the basic salary are transport allowance, meal subsidy, utility allowance, leave grant, furniture allowance, domestic servant allowance and drivers’ allowance. This is applicable to all top public office holders in Nigeria, such as Special Assistants to the Presidents, Inspector General of Police, Clerk of the National Assembly, National Security Adviser and a host of others. However, Rent Allowance has not been consolidated with the rest of the allowances in the emolument package. It is, therefore, payable as contain in Info-graph 10, where an officer is not provided accommodation at Government expense. Cost of air ticket is to be fully borne by Government at the prevailing rate. N1, 000 per day for all married and un-married officers for 28 days. Cost of transportation to be borne by Government to a maximum of one, 20ft container and 50% rebate on one car. Cost of transportation to be borne by Government to a maximum of one truck at the prevailing rates per kilometer. Note: Air ticket is to be provided for spouse and a maximum of four children only if they accompany the officer. Shift Duty Allowance is payable to only Nurses and other health Professionals in the Federal Health Institutions who perform shift duty in accordance with an existing shift duty roster at the rates contained in info-graph 15. Scarce skill allowance is applicable across the Federal Public Service and is payable to officers with exceptional skills at the rate of N1,200,000.00 Per Annum. However, the modalities for determining what constitutes exceptional skill will be worked out before this is implemented. It should be noted that exceptional skill is subject to review annually based on performance. What am I to earn as my take home pay as a Principal Medical Officer who works in a Federal University Medical Center? Waiting for your reply. Thanks. 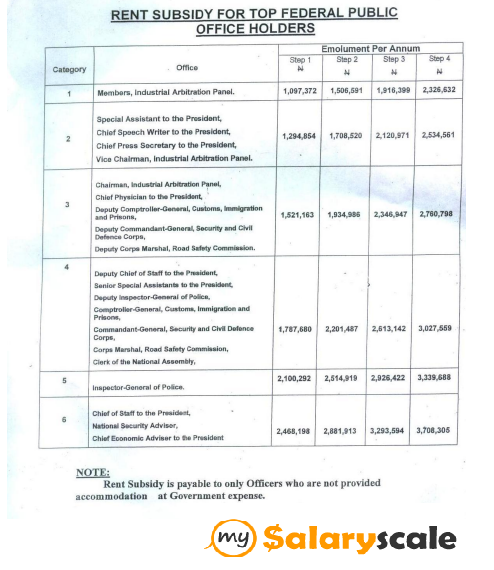 Please how is severance pay calculated for federal civil servants. Specifically a lecturer in a federal university. Is there a specific formula used? Please what is the payment structure in the states like? 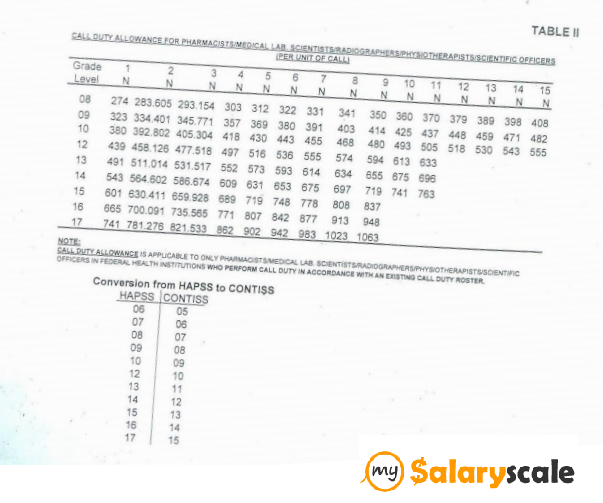 I could only find Lagos states salary table/scale online. I will really like to find out what it is for other states, especially cross river state. 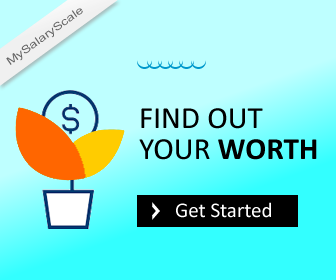 Also, if you need to check for other states, simply type in the state in the “location” field and click on the “search salary” button. 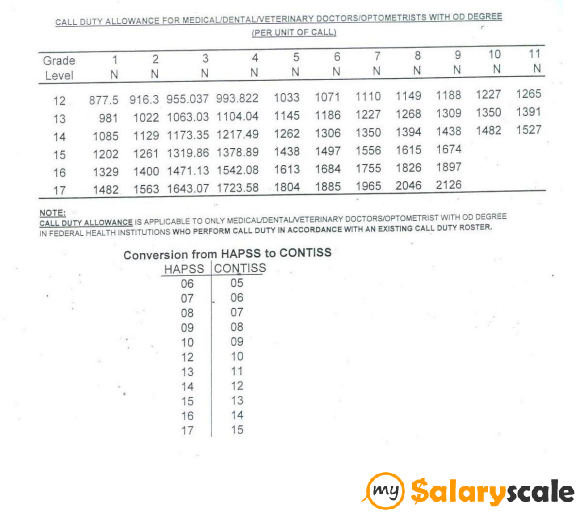 Please how much is an admin staff in a federal hospital expected to earn after tax deductions? What is the salary of Level 9 agric extension officer at federal level? 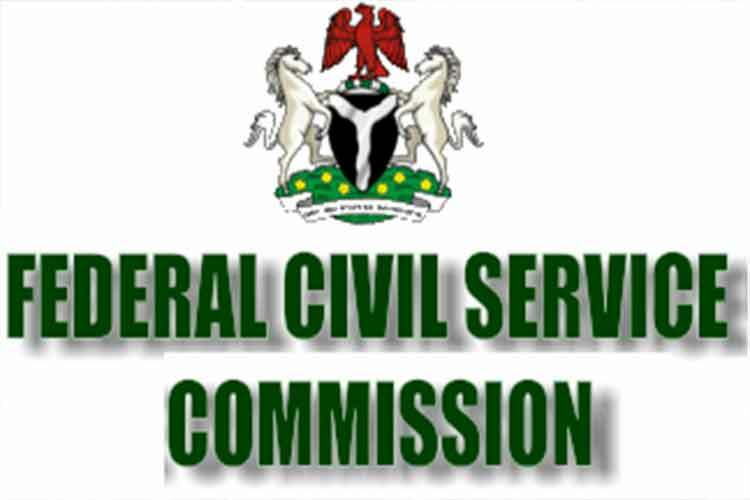 Officers’ in Level 09 Step 01 and Level 09 Step 15 will receive N81,000 monthly working at the Federal Civil Service Commission. This sums up to a salary of N978,663 yearly. Hello Ken, thanks for contacting us.